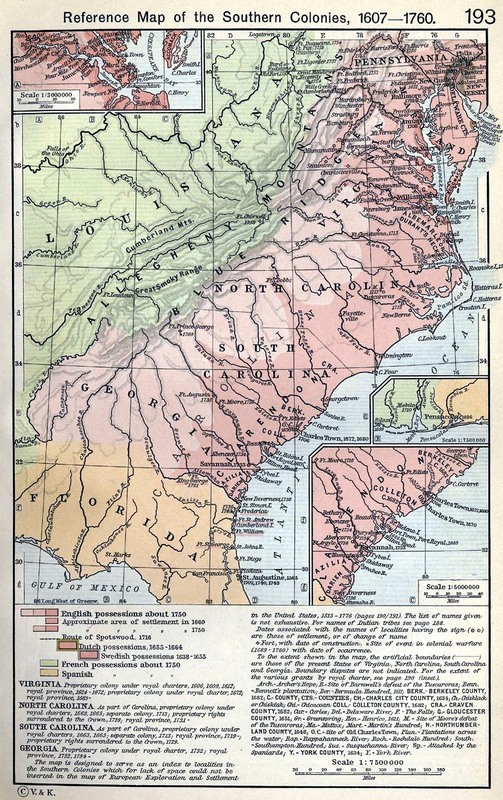 North Carolina might have been the first or original English colony. 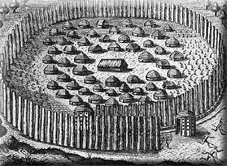 In 1585, a colony was attempted at Roanoke. Nobody knows for sure what happened to the colonists, but when the ships returned there was no trace of any survivors. They were probably attacked by Indians or did not survive the winter. It would be another century before a colony was attempted in the area again. North Carolina was awarded as a proprietary colony in 1663. In the decade before some Virginians had moved south from their own colony and had set up small settlements. The Royal Charter formalised ownership of the entire area south of the Virginia Colony to the Spanish settlements in Florida. This whole area would be referred to as the Carolinas. Being so large, the Carolinas were divided administratively in 1691. This was formalised in 1729. The area was heavily forested and remained one of the most undeveloped parts of the 13 colonies. More information on the 13 Colonies.